Ladies and Gentlemen, your Canada Reads 2013 Longlists! Gold Star Goes To: British Columbia, with 9 women & 1 man nominated. Lots of books I’d like to read among these finalists! Get your votes in by November 12th and on the 14th we’ll know who our finalists are! One week left to get your Canada Reads 2013 nominations in! I’m waiting ’til the bitter end to send mine in, and in case you are too I’m offering recommendations as a free public service! There’s a catch, though, which is that I am trying to bring our heritage back, trying to drag an oldie into the mix to see how it holds up in debate to all the youngsters we’ll no doubt see in the line-up. All of my recommandations will be at least 20 years old, arranged by publisher to give you all a sense of who is keeping what in print, in case you have forgotten. So far I’ve talked a little about House of Anansi’s A-List, the University of Alberta Press, and McGill Queens University Press. That’s two academic publishers to one mainstream – a bit of an inevitability when you’re talking about who is willing to provide the public service of guarding our cultural heritage for its own sake. But there are big players in the Classic Canadian Literature game, maintaining lists of, also inevitably, some of our biggest, brightest, most well-known literary giants. There is a romantic tendency, on my part as much as anyone’s, to want to use Canada Reads as a vehicle to promote lesser known writers deserving a kick at the Professional Writer can. While I absolutely want to see some unknown titles on a good top-five list, I also like to see a few good old stalwarts. It lends credit to whoever wins – an unknown winner among unknown nominees feel a bit like a straw dog, standing in for something with a real soul. If a book is that good, surely it can stand it’s own against the best? Penguin Books Canada will probably represent at least one or two of this year’s finalists, whoever they be. But I’m going to look in particular at those titles which have made Penguin’s internationally relevant Penguin Classics line. I’m not going to lie to you, some of these books are on my list of all-time favourite books. They stand up against the giants of literature from any country, any time. I’d be happily shipwrecked with them. I’m so proud to be a product of the same culture which produced them. I hope to Pete that you had to read them in school, if not on your own time, but if you haven’t, do yourself a favour: do. It is an abject CRIME that Davies has never been represented on a Canada Reads shortlist. This is probably my favourite book by one of my favourite authors. 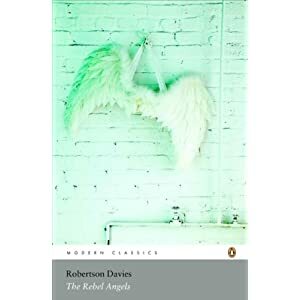 From the blurb: “Gypsies, defrocked monks, mad professors, and wealthy eccentrics—a remarkable cast peoples Robertson Davies’ brilliant spectacle of theft, perjury, murder, scholarship, and love at a modern university.” How could you not love this? Votes are due in October 24th! I can’t believe how soon that is, so without wasting more time today I continue my Canada Reads 2013 campaign. For those of you just tuning in, I am bound and determined to raise the visibility of older works of Canadian literature, and so I will be featuring some overlooked publishers who have been keeping up the good work of keeping older CanLit in print. I hope to make a range of suggestions for each region defined for this year’s competition. Last week I pointed to House of Anansi’s A-List offerings and the University of Alberta Press. I had to mention this somewhere – possibly Canada’s first science fiction novel! An oddball work of adventure and philosophy very much in the vein of Edgar Rice Burroughs or, hell, George Sand. On Tuesday I fielded the crazy idea that Canada Reads 2013 should feature one, if not more, older books. My reasoning being that we in Canada like to pooh-pooh our history without knowing it very well, and as the years crawl by deserving writers who forged the path for the newer ones are being forgotten and neglected. Canada Reads lets us remember them and, perhaps, compare them to the newer generation to see how both have fared, how both came to be, and how the old informed the new. Despite what you might surmise after browsing a bookstores shelves, quite a lot of good Canadian Literature remains in print in excellently curated serieses and editions. Over the next two weeks I will feature a number of presses who keep excellent backlists, and I will put forth some regional suggestions of classic CanLit which are at least 20 years old. Before you cast your vote in this year’s competition, I hope you will stick with me and remind yourself of some older but still worthy contenders. Looking West? Let me point you at the University of Alberta Press, whose cuRRents series in Canadian Literature contains some excellent choices. Canada Reads has asked us to stick to full-length novels this year, but I hope you’ll have a look at U of A’s full list out of your own interest – they have a special focus on poetry and no small number of short story collections. But here are four novels from two under-read Westerners for your consideration!